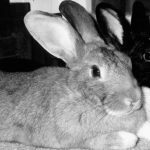 Membership in HRCHouse Rabbit Connection, Inc. Become a member of HRC! We were on HRC’s very first billboards! As a House Rabbit Connection (HRC) member, you will receive HRC’s quarterly email newsletter, In Pursuit of Hoppiness. For a sample issue of the newsletter, please contact us.